The rise of Western scientific medicine fully established the medical sector of the U.S. political economy by the end of the Second World War, the first "social transformation of American medicine." Then, in an ongoing process called medicalization, the jurisdiction of medicine began expanding, redefining certain areas once deemed moral, social, or legal problems (such as alcoholism, drug addiction, and obesity) as medical problems. 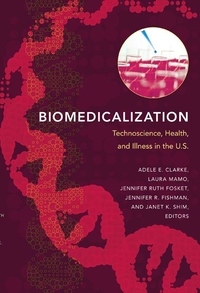 The editors of this important collection argue that since the mid-1980s, dramatic, and especially technoscientific, changes in the constitution, organization, and practices of contemporary biomedicine have coalesced into biomedicalization, the second major transformation of American medicine. This volume offers in-depth analyses and case studies along with the groundbreaking essay in which the editors first elaborated their theory of biomedicalization.